‘LIFE IS either a daring adventure or nothing,” I read on the table mat in front of me as I sat down in a restaurant for dinner. Several other inspiring quotes about travel were also printed on it, but after a day battling an old Royal Enfield Bullet motorcycle along 120km of urban Indian roads before emerging, finally, into a landscape of jungle, spice gardens, tea plantations and even wild elephants and monkeys, this one seemed to be speaking directly to me. In fact, I wasn’t sure if I’d seen anywhere as beautiful in all my life. 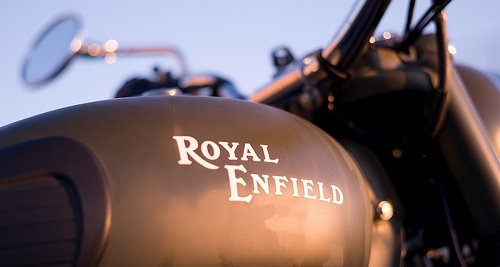 Why the Royal Enfield? 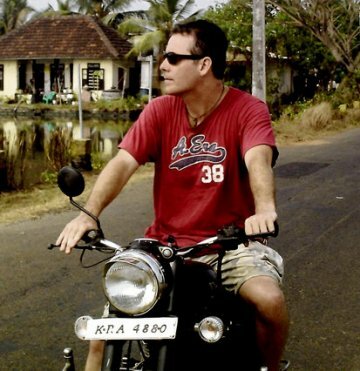 Riding a motorcycle in India puts you smack in the middle of this fascinating country like nothing else. But add the movie-star appeal of being able to straddle a classic 1950s 350cc Bullet for less than €10 a day and biking in India becomes irresistible. Still in production in Chennai, the Royal Enfield – now the world’s oldest motorcycle brand – was adopted in the 1960s by the Indian government for its police and army, and it has since become one of India’s most loved brands. It is perfect for long journeys and hilly terrain, and, with a maximum speed of about 100km/h, the only really dangerous thing about an Enfield is that it can cause novice bikers like myself to become overwhelmed by thoughts of shipping one home or, better still, moving to India. Kerala is the India you dream of, without the dirt or the eye-popping poverty and with so much natural beauty that the signposts all claim it, more than fairly, to be God’s own country. 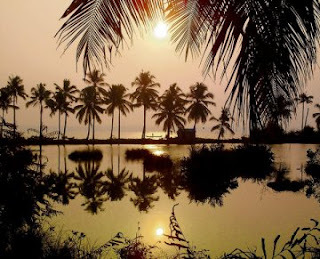 With so much beauty around, as much in the people as in the place, you can be forgiven for thinking that Kerala is something of an Eden – a place so filled with coconut palms and lazy backwaters that God must have sketched it in a particularly inspired moment. And yet with roads and houses that seem far superior to those in other parts of India, the country’s highest rate of literacy and good, cheap doctors seemingly around every corner, some credit must go as well to the communists who have controlled Kerala since 1957. With its red hammer-and-sickle flags fluttering along every centimetre of road, it reminded me of that other communist paradise of Cuba. But this was far better than Cuba, I soon realised, and I knew now why National Geographic rates Kerala as one of the top 10 paradises on earth. 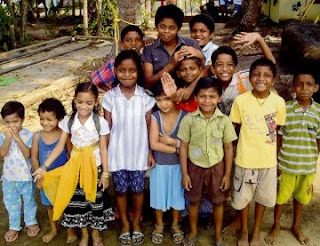 Compared with other parts of India, Kerala is also safe, friendly and refreshingly unpushy. The food is buttery and delicious, the shops sell every kind of organic lotion and potion you can imagine – including Ayurvedic massage treatments for tired, stressed-out westerners – and, as if all that were not enough, the state is full of “toddy shops” where for about €1 you can get quietly sozzled on surprisingly quaffable coconut poteen. So if there really is a heaven on Earth, this must be it. Driving in India is not for the faint-hearted, though, especially by motorcycle, and before escaping the 40-degree heat of the port city of Cochin for the cooler tea estates of high-up Munnar, I went to a church, a mosque, a Hindu temple and even a synagogue, to cover myself with just about every god going, and give me every bit of luck on the roads. Which must have worked, as it’s hard to think of any other explanation for having made it back in one piece. You can tell a lot about a country by the way it drives, and Indian roads are pure chaos. It’s not aggressive as in Italy, though, and with the bold exception of bus drivers who would gladly run you down if they thought it might get them to where they’re going a little faster, most drivers incessantly sound their horns in a thoughtful effort not to kill you. In fact, once you get used to it you will be driving like a local yourself – on the wrong side of the road, overtaking on blind bends, carving up taxis – and feeling so relaxed that you can’t help but laugh when, amid the chaos, you see someone painstakingly taking a driving lesson. Having somehow made it safely back to Cochin, where huge cruise liners ease into port, I rejoiced at having found the perfect city in Kerala as well. The centre of Fort Cochin is a crumbling, mosquito-infested backwater, the sort of place that Charles Laughton might have popped up in a 1940s film, wearing a sweat-stained suit and a crooked Panama hat. The temperature was already 35 or 40 degrees by day and a not exactly frigid 26 by night, but by this time I was madly in love with the place, and couldn’t think of dragging myself out of this tropical commie paradise to go anywhere else in India. 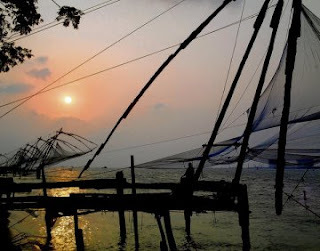 Between Cochin and the town of Alleppey, whose hyacinth-choked canals have deservedly earned it the name of Venice of the East, the Enfield and I headed next down the exotic Malabar coast. The roads, filled with old Ambassador cars and even other Enfields, laced perfectly between the warm Arabian Sea on one side and sublime backwaters on the other. Children shouted and waved, beautiful women smiled and, as my subconscious took over the hard work of motorcycling, I found myself lost in what ever thoughts I had. It was wonderful biking country, and as I stopped along the way to wade neck-deep into the Arabian Sea to help Keralite fishermen push their boats out, or to chat to elephants by the side of the road, or purchase a kilo of dirt-cheap tiger prawns from a fisherman’s pirogue, I realised I had probably never felt happier or freer in my life. Even the sense of humour here was irresistible, as I discovered when I got back to Cochin. Smiling taxi drivers whom I’d never laid eyes on before pulled up as I walked out for dinner and said: “Are you looking for me?” And one night as I sat in a restaurant, slapping my arms against the swarms of blood-suckers that have made languid Cochin their eternal home, a man with a straight face came over and implored me not to kill the mosquitoes. “Why?” I asked. “Because it’s our national bird,” he said, erupting in laughter. As my trip came to an end, however, my sense of humour – and that of everyone I was sitting with in one of Cochin’s most popular nightspots, the XL bar – found itself challenged one day as Indian commandos flooded the streets in anticipation of another Mumbai-style terrorist attack. A woman whose eyes were all that was visible through the slit in her burka came into the packed bar alone and unchallenged. Islamic women rarely if ever go into bars, especially ones with only western tourists in them, and even the local bar staff suddenly looked pale and unnerved. The incident was so rare it made the newspaper the following day. It was only then we discovered that the woman, a western tourist herself, had resorted to wearing the burka to avoid any more sexual advances from local men. But that night, as the bar held its breath, and the woman with strange blue eyes walked around it, you could have heard a pin drop. Which is, of course, what everyone was hoping they wouldn’t hear. Etihad (etihadairways.com) flies to Cochin from Dublin via Abu Dhabi and from Belfast via London Heathrow and Abu Dhabi. San Mike Tours. KB Jacob Road, Fort Cochin, 00-91- 484-2215385, sanmike_tours@ hotmail.com. Basic rooms for about €9. Old Courtyard. Princess Street, Fort Cochin, 00-91-484-2216302/2215035, oldcourtyard.com. An old Dutch building remodelled with modern interiors. Famous for its dinner parties. Expect to pay €45-€75. Raheem Residency. Beach Road, Alleppey, 00-91-477-2230767/2239767, raheemresidency.com. Bibi Baskin’s 10-room boutique hotel once proudly hosted Gandhi and Nehru. From €90 to €210. Krishna Kripa Seafood Restaurant. Opposite Santa Cruz Basilica, Fort Cochin. Tasty, great-value food. Bring fish that you’ve just bought at the seafood market next to Cochin’s Chinese fishing nets and they’ll cook it for you. Cochin Fort Restaurant. Near the bus station. Use your huge menu to swat away the even bigger mosquitoes at this popular outdoor restaurant, which has a great night-time atmosphere. History Cafe and Terrace Grill. Bruton Boatyard Hotel. 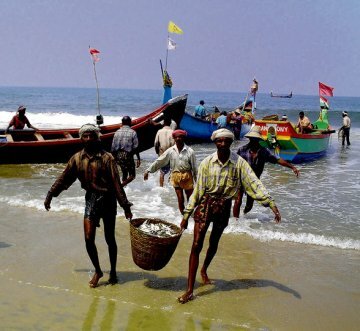 Fort Cochin, 00-91-484- 2215461, cghearth.com. If being served fresh seafood cooked in a tandoor while looking out at the dolphin-rich waters of Cochin Harbour sounds okay, then it’s hard to beat splurging on a meal here. Rent an Enfield motorcycle from San Mike Tours (00-91-484-2215385, sanmike_tours@hotmail.com) for about €9 a day, excluding fuel. Or buy an Indian-made Enfield motorcycle for about €1,200. Just remember to say your prayers before setting off for the tea estates of Munnar or down the Malabar coast towards Alleppey. After a long day riding, go for a beer at the XL bar on Rose Street in Fort Cochin. It’s the place to meet other travellers. Or visit Cochin’s synagogue, on Jew Town Road, to see one of Kerala’s most beautiful and historic buildings.